The Bureau of Land Management on Wednesday captured 63 wild horses during a second day and final of helicopter drive trapping at the Bible Springs Complex near Minersville, Utah. Looming over the roundup is the ongoing threat of legislation in Congress that would allow BLM to shoot healthy unadopted wild horses and burros. 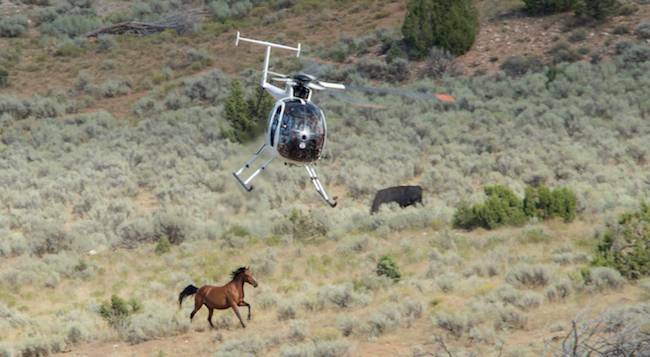 A BLM contractor’s helicopter pursues a stallion as cattle graze undisturbed during a 2016 roundup at Blawn Wash, one of three Herd Management Areas in Utah to which BLM has returned this week to capture more wild horses. RTF file photo by Steve Paige. A total of 125 wild horses were captured during the two-day roundup. No wild horses were injured on Wednesday, according to the BLM. A 5-year-old stud was euthanized on Tuesday after the discovery of what the agency said was a preexisting injury. BLM did not provide a gender or age breakdown of the wild horses captured. The agency again rated the body conditions of the horses as 4s (moderately thin) and 5s (moderate) on a 10-point scale. The captured wild horses were transported to the Axtell, Utah, Off-Range Corrals. They will be put up for adoption, with unadopted wild horses transported to long-term holding pastures, according to the agency. The removal of the wild horses at Bible Spring comes as some in Congress are pushing to allow BLM to euthanize — shoot — healthy, unadopted wild horses and burros. BLM set out to capture 100 wild horses from federal, state and private lands in and around the Bible Springs Complex near Minersville, Utah. The complex is made up of the Bible Spring, Blawn Wash, Four Mile and Tilly Creek Herd Management Areas. Blawn Wash will not be included in the planned roundup.